The 2011 competitive season is over. It’s been long but varied, having competed in a range of sports from ski-mountaineering to mountain running to MTB Marathons, with the odd road event thrown in for old times sake. One thing that feels totally normal is a burned out desire to have at least a month of no structured training to recharge the batteries. The season has finished with moderate success. After the body and soul-destroying Grand Raid (definitely back for next year by the way) I thought twice about riding the Gruyere Sportif the weekend after, but a few days of rest and a decent massage combined with a cooler weather forecast made me think it was possible. In fact the race started very well, with good feelings up the Mitteberg climb, before just about hanging on over the Col du Pillon. Things went wrong on the Col des Mosses as the power just ebbed away leaving me in no-mans land at the top of the climb. I was saved on the descent by the train that was Dean Windsor, riding the event in support of some other riders. We gunned the last 30km to the finish although I was sad to not be strong enough to do a turn having cramped badly. The good news was I finished well enough in the 30-34 age category to qualify for the new look UCI World Championships for Masters and Amateurs in Stavelot, Belgium. This was not a planned event but it fell on a weekend where I had just enough hours free to drive to Belgium, race and get home so in the entry went. Before heading to the unofficial home of cycling there was the small matter of the Giron du Rhone to finish off, with a hill climb nearby in Blonay. I thought it would be a good tune up for Belgium but suffered like a dog, not even making the podium in the populaire category, although my 4th place was more than enough to secure the overall victory in this series of seven events. The drive to Belgium was quite epic solo, with amusement coming in the form of road signs such as “Wankdorf” and “Bitche” before hitting some derestricted autobahn. Nothing sharpens the senses on a long drive like hitting 220kph on a straight downhill, and I was in Belgium in good time for a recce around my hotel in Trois Pont. The parcours for the race was based around climbs used in Liege-Bastogne-Liege and Fleche Wallone and it was the kind of course that would have suited me to a tee if I had anything like decent form- seven climbs between 3-5km in the last half of the race that suited punchy/power climbers (most had “Phillipe” written all over them). The finish line came immediately after an ascent of the infamous Stockeau climb and involved 300 metres of slippery cobbles to the line. The race started well, I moved up in spite of race rustiness and had a pop of the front to try and bridge to an early break on the first time out of Trois Pont. Things got a little worse at around 40km where the road surface deteriorated to an almost unrideable state and with spray from the morning rain everywhere I foolishly allowed myself to slip back a little. As we approached the Ancienne Barriere the race was still together but I was now towards the back of it, and on the descent back towards Trois Pont I lost contact a little. The riders around me formed a group and we had a strong chase back, only just missing the bunch before the next climb where several more riders were dropped to join our group. 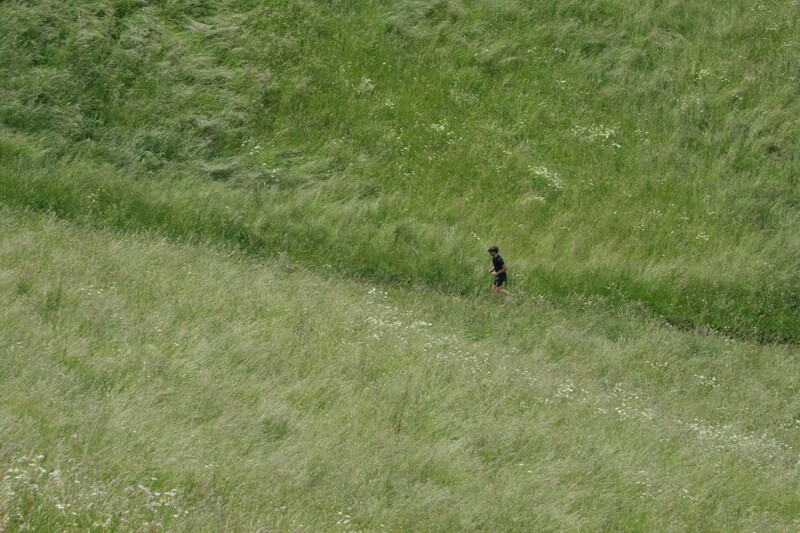 I had something of a second wind as we passed the finish line halfway through the race, and gave it some beans up the Haute Levee where the field was now strung out. The killer with the Haute Levee though is the long drag after the steep section, and again on the descent I lost the wheels a little before Le Rosier. Now a little isolated I was passed by Martin Smith who was racing in a different category that had started five minutes after ours and he gave a cheery insult about holding wheels before riding off into the distance. A group of us did form at his point and we rode together almost to the finish, until the Stockeau finished me off with it’s long stretch at 21%. I didn’t even get to see the Eddy Mercxx memorial I was so destroyed. Having completed the race 26th out of 60 in the 30-34 group I shoved the bike in the car and headed south, with Sportsbalm still burning my legs and Belgian toothpaste all over my face. Driving into the night in pouring rain after a race in the Ardennes was a poor decision; I made it home at 2am. This Belgian experience felt like the closing of a chapter on serious road racing which I have tried to keep up in the face of diminished training hours and waning motivation. Next year the focus will be more on MTB Marathons, and we’ll see what happens. In the meantime there is the small matter of a winters ski-mountaineering and cross-country to look forward to! The 2011 Grand Raid goes down as my worst day on a bicycle. The event is one of the toughest MTB marathons in the world at 125km, but it is not the distance that makes this a killer, it is the climbing- 5025m of ascent on a combination of road, fire road, single track and even a 45 degree scree slope. The scree carry comes on the final epic climb involving a 2km push and carry at well over 2000m in altitude. Ouch. To top it all the 2011 edition was run on just about the hottest day of the year with temperatures over 30 degrees Celsius. I should also mention that the race takes in some of the most breathtaking scenery in the Alps, not that you get to enjoy much of it along the way. Having got up at silly O’clock to get to Verbier for the 0630 start, I lined up with the other six-hundred or so starters for the full distance race. The first two hours were nice and cool and I felt comfortable until after the first descent into Nendaz where my back was beginning to become painful. This got worse and by the time we reached Heremance I was losing positions but felt able to carry on. Then the heat started to take effect. Mindful of the dreaded hunger knock I stuffed my face at the bottom of the Mandelon climb, however this turned out to be a big mistake as just five minutes later I was vomiting at the side of the road. I plugged away up the climb but a corner had been turned: I was now definitely suffering and questioning whether to bother carrying on at all. 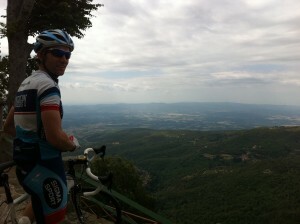 There was another feed station at the top and the pattern repeated itself: stuffed face, vomiting five minutes later. This time things got even worse because on dismounting to be sick my hamstrings went into severe cramp. The words of my wife came into my head: “activate the paired muscle when you cramp” so I focused on tensing my quads, only for them to cramp as well. There I was screaming on the side of the trail as other riders just carried on until one very kind chap turned and offered me a sachet of Magnesium. I rammed it down and it seemed to do the trick, so on we went. The dirty secret of the Grand Raid is actually not all the climbing. The real problem is dealing with mixed downhill sections of technical singletrack, very loose gravel and steep, rough ski slopes when you already have hours of riding in the bank. There is little chance to rest as the body gets hammered in a different way, and so it was on the long and occasionally technical run down to Evolene. The final massive climb from Eison (1650m) to the Pas de Lona (2787m) killed me. Soon after Eison my back went from bad to worse, as I found I could not pedal for more than five minutes without it seizing up in agony. On long road bike climbs a good strategy is to climb out of the saddle for periods to relieve pressure and stretch the back a bit, but the MTB forks had lost their damping and did not lock out (this probably explains some of the punishment on the descents as well) making every pedal stoke a psychological blow of energy lost. I fell into a routine: five minutes pedaling followed by a few minutes walking- not the fastest way up but a way up. The sun was relentless above the tree line, and having reached the crucial last time cut at L’A Vielle I knew that come what may I would finish this bloody race. That was until I rounded the corner and saw the hell that was a 2km push and carry up scree to the Pas de Lona. On the last rideable section before this I gave one final dig in the granny gear only for the chain to give way under pressure and snap. I was a fair way from any mechanical support on one of the more remote sections of the course and really had no idea what to do (in hindsight always carry a chain splitter and missing link in an event like this…). Acting on impulse as the next rider came through I asked in my best ‘Franglais’ if they had a chain link and it turned out he did. Somebody somewhere wanted me to finish this race as the chain had snapped perfectly leaving two ‘female’ links that took about ten seconds to reattach. On reaching the highest point of the race at 2792m I wept with joy at seeing the ‘Grimentz 15km’ sign- all downhill. Minutes later I was still weeping but now from the pain in my wrists, arms and back descending a very rocky and rough track to the Barrage de Moiry. The final singletrack into Grimentz was gruelling on a broken body, but soon enough the 1k to go sign appeared and I had a bit of an emotional few minutes from the combination of pain, knowing my wife was waiting at the finish and I suppose just from knowing that against the odds I was going to finish. I crossed the line in tears. Living in the Alps is wonderful, with superb riding in stunning scenery, however there are a few drawbacks. One is that with long mountain winters a great deal of building work has to take place in a condensed period of time during the summer, with work usually starting at 7am. This summer the chalet next door to us decided to demolish their existing house and rebuild a new one from scratch- needless to say our planned few weeks of relaxing on the terrace has been somewhat spoiled. Another problem is the climb home that can seem endless at the end of a long ride and even more of a psychological barrier at times, a factor that leads those of us who live at the top to drive down with the bike every now and again just for a break! It was then a most welcome suggestion from the wifey to head south to Italy for a break from the mountains. We had a few criteria for the week: somewhere to stay that was dog friendly; a good base to explore the sights of Tuscany and obviously access to some good bike rides. We have not been disappointed. There are so many joys to exploring a new area by bike rather than on foot or in the car. The first is that the speed of traveling is fast enough to see a variety of scenery, but not so fast that you can’t absorb it. The second leads from this in that it becomes more natural to stop and admire a great view rather than being unable to find a convenient spot to park the car. 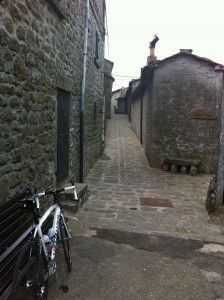 Finally, exploring by bike leads you away from the beaten paths of others and into the more natural country: is there anything better than taking a turning on a whim to find yourself at somewhere like ‘Il Borro’ a restored medieval village run as an exclusive resort by an Italian shoe designer’s family? 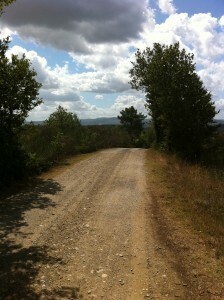 The riding in Tuscany is wonderful mainly due to the great variety of terrain. The area we’ve been riding around is between Firenze and Arezzo in the Arno valley (famous for being the back drop in Da Vinci’s Mona Lisa)- flanked by good hills with climbs and containing wonderful back roads. We did just about the biggest climb possible on day one (the irony is not lost on me after the complaints in the second paragraph…) followed by rides in wonderful rolling hills (puncheur’s paradise) that wind their way through olive plantations and vineyards . The road surfaces are generally good, although there are several bad stretches that reminded me of Surrey lanes, and of course if you fancy it you can head onto the infamous ‘strada bianchi’ for a bit of rough. The drivers are actually OK, the problems we’ve had here have been at high speed in the car on the Autostrada where anything seems to go, otherwise motorists seem to be considerate towards cyclists- especially the local team cars I keep seeing who are eying me up as they pass! 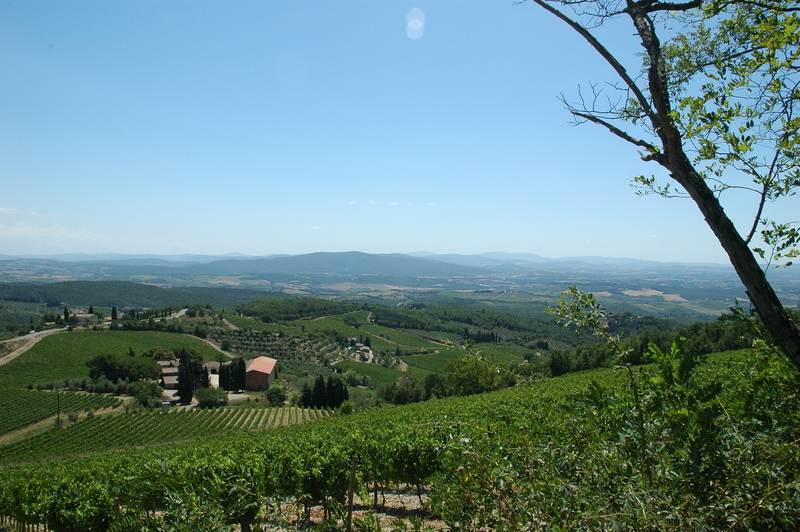 For anyone looking for a setting that offers great scenery and weather, superb food and wine and some of the best riding in Europe I can heartily recommend Tuscany. I’m sure we’ll be back. Having achieved the top step of the podium just once in my last year of serious racing it has been rather refreshing to climb onto it three times this week, even if like today it’s just a painted log. Having won the uphill run and last round of the Giron du Rhone in the populaire category last week I managed to slip away from the school sports day to race a hill-climb from Chatel St-Denis to Les Pacots on Saturday afternoon. This was an advertised 5.7km course with a tough last section that ramps up to well over 10%. The reality was that we started as one large bunch of around fifty riders and were led out of the town by a lead car before being given the toot to start with 4.4km to go. The race started way too fast for my liking; I had expected to hold my target wattage of around 350 but was forced to start much harder. I let the front runners go and then gradually worked my way back up through, although never caught the really skinny guys who had vanished up the road. I rolled in for 6th place overall in 16:05 having overtaken almost all the field on the way, and held an average wattage of 374- much higher than predicted so time to readjust FTP again… The important thing was to win the populaire event and defend my overall lead and this was a success even getting a mention on the front page of the Rhone Cyclisme site. It’s been a good few days. Last week I swapped the bike for some inov-8 trail running shoes in an effort to transform cycling legs into mountain running versions. Perhaps just two runs prior to a race is not in the textbook of specific training, but it seems lots of climbing on the bike translates well into running up hills. Last Saturday was the summer “Challenge” at school, where the whole staff and student body get bussed down to the Rhone valley and then run back up nine kilometres with over eight-hundred metres of climbing. Having done little running and with some real competitors- both another staff member and a 6th form student who are seriously fit- I talked down my chances to those who asked. All I can say is that the Inov-8s were awesome and I put four and a half minutes into my time last year and was comfortably first across the line. Tonight I escaped the current cloud land of Villars (the mist literally enters your room if you open the window…) and emerged into the valley for round three of the Giron du Rhone series. This was my most local race and I wanted to win it, although my chances were reduced when I saw my nemesis from the last round there. Only twelve or so populaires signed on, and we set off after the open race had done two laps. We all know each other now so no sneaky early attacks stuck this time, and it ended up quite the chess game for the first half. I tried to blow things apart on many occasions and forced a split that stuck with four laps to go. We then caught the open race bunch who seemed a lot slower than us, and as we eased into this pace the other populaires make the junction as well. Race savvy told me that they would have worked hard to get to this bunch so I went straight on the attack, taking my chum and a team UCI/CMC rider with me. We hammered the final lap and the CMC rider led us out with me launching a sprint with two-hundred to go. My rival never appeared alongside me- at the end he told me he thought there was a lap to go! Next event is a hill climb- bring it on! Lake Geneva is pretty big, in fact even following a fairly direct route around it the distance is some 180km, taking in the scenic lakeside towns of the Swiss riviera; the magnificent Laveaux vineyards; the French towns of Evian and Thonon and Geneva itself. Today saw the 8th running of the Cycletour du Leman with over 1500 riders signed up for the full 180km route. I did this event last year in miserable conditions and missed being in a fast group, doing the lions share of the work on my own at the front of a weak bunch. 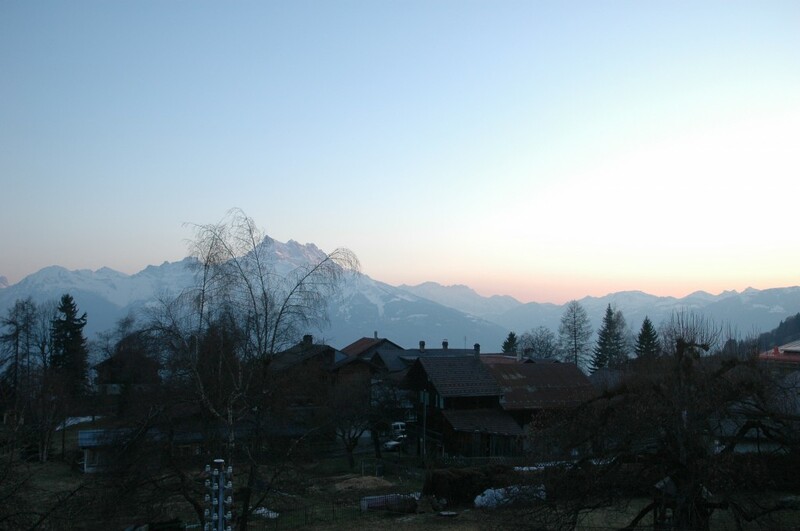 Thankfully this morning was beautiful with the sun rising in the rear-view mirror on the drive to Lausanne and I arrived in good time to make the first ‘wave’ of riders whom I expected to be fastest. Sadly, on departing Lausanne it became apparent others in my group were not as strong as I had expected and we were caught in Montreux by the second group who included several local racers I recognised as well as a large English speaking contingent of triathletes, one of whom was wearing an old-school Sigma Sport jersey. This new group was much faster and we averaged over 40kph through France before turning back for the finish at the western end of the lake. The Sigma jersey was strong, as were a few others, but we struggled to split the group of wheel-suckers behind. In the last 50km I made several attempts to instigate breaks away from the large group of twenty or so remaining. After two ten minute solo breaks I realised Mr. Sigma and others were content to reel me in each time. A couple of guys did stealthily slip away and I rolled in with a much depleted bunch of six guys. The results reveal my time was around 16th, and I was cursing myself for not knowing that the second group usually contains the stronger guys- had I started with them it would have been around 6th place. Never mind, this was not really a race; more a chance to get a long fast ride in which was one of the reasons I was happy to keep launching attacks in the last hour. At the finish we had a chat and I discovered that Mr. Sigma was none other than triathlete Andrew Johns (AJ) who lives in Leysin which I learned was the place to be for triathletes with fifteen or so of the worlds best living there. He was sponsored by Sigma Sport for twelve years in his prime. Full results are here, my data showed a time of 4 hours 21 mins; a TSS of 325; average speed of 41kph and a normalised power of 270w. Good form building! Not the only sandbagger- 2nd again! Wednesday evening saw round two of the Giron du Rhone series, an evening crit around the village of St.Pierre-de-Clages near Sion. The course was quite technical, winding it’s way through vineyards with several ninety degree turns, and this combined with both a fierce headwind section and an uphill drag to the village square finish line made it a challenge. I was once again in the Populaire category, setting off behind the open race after their second lap. There was a handy looking guy from VC Vevey who would need watching, but I broke the golden rule of racing- always stay near the front. The field was only a maximum of fifteen riders so I started in leisurely fashion at the back, but before I knew it wheels had been dropped through the twisty bits and my man to mark had already blasted a twenty second lead. The others with me were either reluctant to chase or not strong enough so I did the lions share of work, but he was long gone having hooked up with a few riders who had been dropped from the open race. This was a frustrating experience as I knew the catch would now be tough. Undeterred I detached myself from the group and proceeded to TT my way around three quarters of the distance to finish a comfortable second but over a minute behind the winner. The upside is I do now lead the overall series in the category. 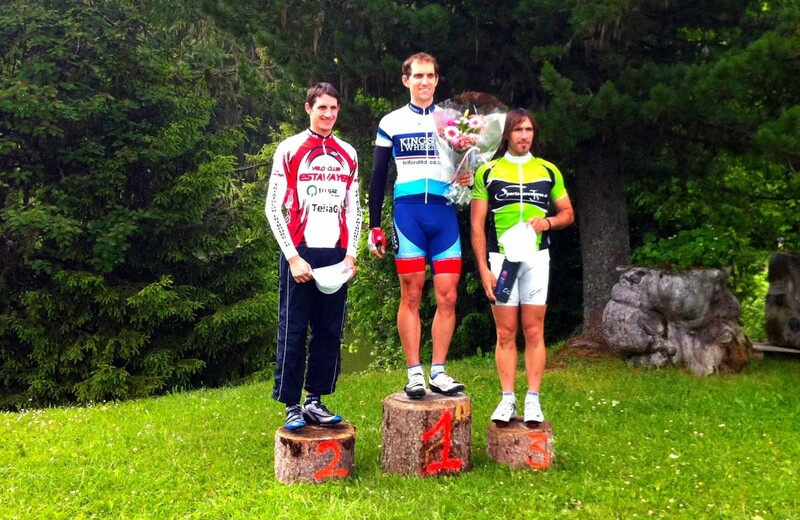 This afternoon I raced in a local series called the Giron du Rhone. There are seven rounds with a variety of crits and long hill climb time trials. It seems to be a very inclusive series with lots of categories, including the ‘populaire’. 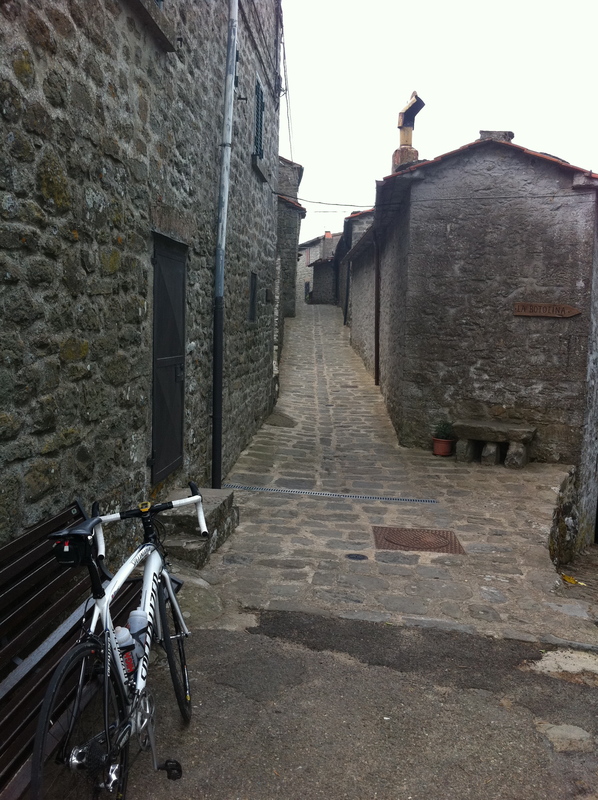 Today was the first round, on a short circuit around a village in the valley called Epinassey. One lap took about six minutes and consisted of a descent, a flat section into the wind then a climb back up to the finish line. Having not taken out a license this year I raced as a populaire, only having to do ten laps rather than the thirteen the licensed racers completed. About twenty or so of us signed on and loitered under an inadequate gazebo as the rain hammered down before being called to the line. As we set off I wanted to get the measure of the field especially first time up the climb. We stayed together first time up but it was clear that there were only three or four guys likely to contest the win. Second time up I gave it some real beans, forcing a break of four riders and for one lap we worked well together. With seven laps to go the fourth rider was dropped on the climb, leaving three of us of similar ability up the road now several minutes ahead of any chasers. As we entered the final laps I began to feel that the two Swiss were not going to let the Englishman win their event, so attacked in an unlikely place by taking a very wet corner a little faster and driving out of it. I was brought back within a few hundred metres. Next, up the climb with two laps to go I attacked hard but was once again reeled in- the top end is missing for that crucial gap. The three of us rolled around the last lap until the climb where I played my last card, a hard attack from the back of the three hoping to demoralise them and get the crucial few metres I needed. Alas, one of them brought me back and promptly blew, not before blocking me a little as the other chap attacked. I tried to get across but the ten metres he got were never closed and he went on to win, with me a little way behind having secured second place. I was so desperate to get warm and dry that I missed the presentation, I think I might have got some flowers for my troubles. A nice touch was getting my ten francs back on handing in the race number: free racing! I’m looking forward to the long hill climbs perhaps with a view to taking the overall series, although work means I will miss one event that might scupper my chances. Tale of the data- happy with the normailised power- shows FTP is perhaps a little higher than my current setting. It starts with the descent; living at 1200 metres in the winter the only way up is a cross-country ski run, so training starts with a drop to the Rhone valley. I feared the worst- 5pm rush hour down the mountain- but the road is clear. I promised the wife I would be safe, so took the blind corners a little slower than normal but I still reach the valley floor in just ten minutes. Through vineyards just starting to turn green and along primrose and snowdrop lined lanes the sun still shines, although less brightly than when I left home. The threat of darkness quickens the pace, and although the valley is warm and tempting thoughts turn to the long climb ahead. As the sun drops below the Pointe de Bellevue and France to the west a line is drawn on the mountain alongside me. Like the light used by Oscar Egg to try and pace the hour record in years gone by this line becomes my target. As the sun sets I rise, ascending on the steeper roads to Fenalet in the 39×25 before changing up on the more gentle gradient through the pastures to Les Posses. The pastures smell of fresh cut grass; a dog barks. The sun seems to be holding a position as I ascend, but I can see the line of shade creeping up the vineyards below covering the roads climbed just minutes before. As I reach the final stretch into Gryon and beyond a two-stroke moped pulls out in front. I use this as a another target, aiming for the back wheel like bridging across to a break in a race. The smell reminds me of summer jobs coppicing woods as a teenager, with two-stroke fumes filling my lungs like the chainsaw used to. Reaching Barboleuse feels good, the road levels out and the speed heads north of 20kph for the first time, and a final spurt brings the climb to an end- not quite a record but good for March. Jersey zipped up, gilet back on and it’s the cool down through Villars to home, the sun now just a semi-circular glow above the mountains to the west. As I take the back route on the low road I realise it is now shady and cold, with snow still lurking on the edges: better watch out for ice. The battle with the sun is seemingly lost, yet like so many battles in my mind I refuse to be beaten so reach back, flick the switch and turn on the rear light.